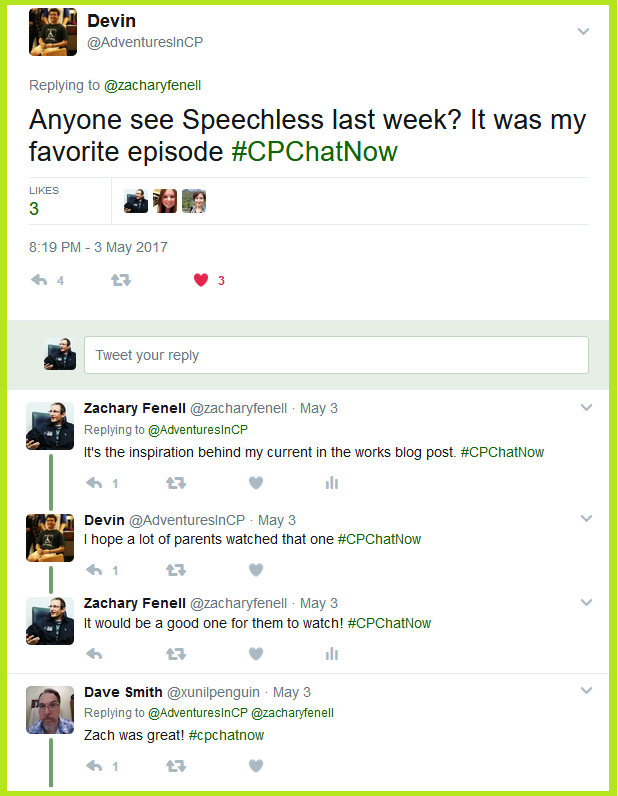 Various topics emerged Wednesday, May 3rd, 2017 amidst the two-hour live cerebral palsy Twitter chat we call #CPChatNow. I am co-host Zachary Fenell and I am here to do but what else?! 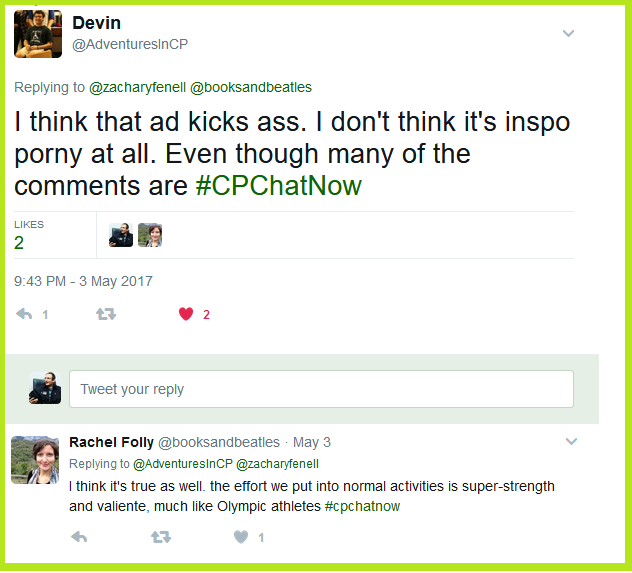 Recap the previous week’s chat. So get ready to chug along. Like I mentioned, the episode inspired my at the time in-progress blog post. Anyone interested can read, “Needing Role Models with Cerebral Palsy.” Warning to anyone yet to watch the episode “R-U– RUNAWAY,” my post contains minimal spoilers. 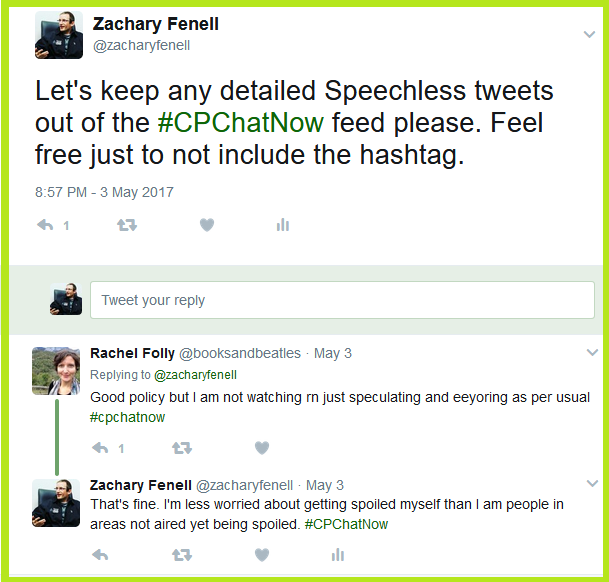 Regarding spoilers, we at #CPChatNow possess an informal anti-spoiling policy. We welcome participants to multi-task, watch Speechless and live tweet us. However we insist on leaving any detailed Speechless conversation outside the chat. Like I explained on May 3rd, this policy intends to protect participants who live in areas where the show still hasn’t aired. After all, people in different time zones and different countries make up our community! Avoiding spoilers demonstrates thoughtfulness. 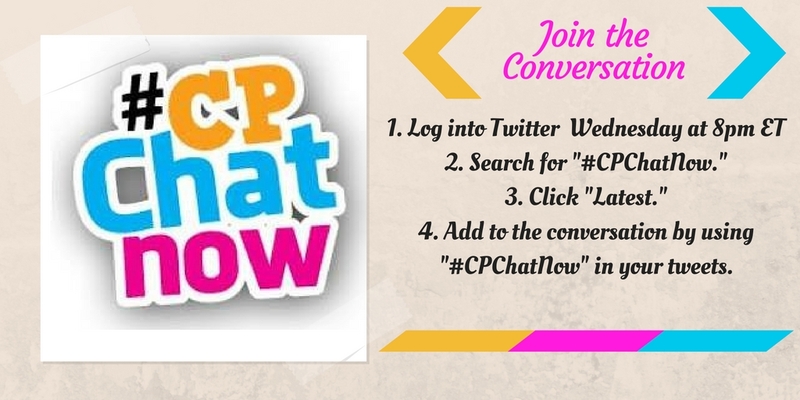 I personally like to think about #CPChatNow as a thoughtful community. Regular Rachel Folly showed mindfulness, bringing up an annoyance she recently came across. Admittedly Rachel’s tweet confused me. Something you can tell by my replies in the above screen shot. Turns out Rachel and I watched different adaptions to the same video. Versions uploaded by separate users. Youtube user bagar5 uploaded the version Rachel linked to. Meanwhile I previously viewed the video uploaded by the official Underarmour channel. Confusion aside, Rachel raised a valuable point with the version she linked to. The term “boy” appears questionable given Johnny Agar’s age. What do you think? Answer for the week’s extend-the-conversation question, “Does the ‘Boy’ reference in the user uploaded Underarmour commercial video bother you? Why or why not?” Respond in the “Comments” section. 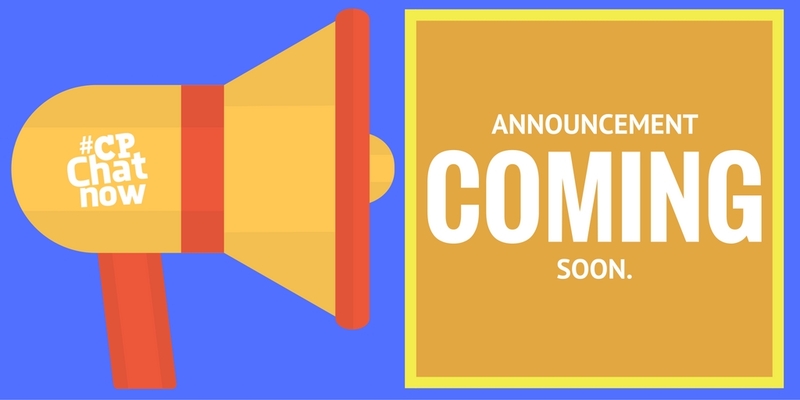 While questions surfaced about the video’s title, reaction to the actual content seemed overwhelmingly positive. Interim co-host Devin Axtman displayed great enthusiasm for the ad. Rachel echoed the positivity, saying she found truth in the video’s message. Long-time regular Jen continued the topic merry-go-round, with some assistance from Guardians of the Galaxy‘s Rocket. As you see from the preceding screenshot, the Guardians of the Galaxy talk soon led to Jen and relatively new regular Dave Smith to bond over collecting POPs. Common interests outside cerebral palsy albeit collecting POPs or baseball, hockey, wrestling, music, etcetera helps us form deeper relationships within our community. Perhaps you will contemplate joining us! Our Twitter chat happens every Wednesday at 8pm ET. Perchance you do not use Twitter, you can always contribute by answering the recap’s extend-the-conversation question. Remember this week’s question asks the following. Answer by commenting below! Until next time. This entry was posted in Weekly Recaps and tagged johnny agar, speechless, underarmour. Bookmark the permalink.